Sunday Funday as we honor "Zeus" with a Hero WOD. U.S. Army Spc. 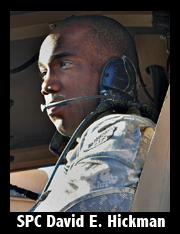 David E. Hickman, 23, of Greensboro, North Carolina, assigned to the 2nd Battalion, 325th Airborne Infantry Regiment, 2nd Brigade Combat Team, 82nd Airborne Division, based in Fort Bragg, North Carolina, died on Nov. 14, 2011, in Baghdad, Iraq, from wounds suffered when insurgents detonated an improvised explosive device near his vehicle. He is survived by his wife, Calli; parents, David and Veronica; and brother, Devon.